With cncKad, we save much time and prevent loss from manual errors. The function “ORD CSV MAP” has good integration with our company’s ERP system with the generation of CSV files. AutoNest Pro makes the best use of different materials with the combination of various parts together on one plate for layout. Also, “Smart Cut” can change parts entry, add joints and apply to SubNest. It avoids repeated cuts and thus ensures safe processing … we are very satisfied with cncKad and highly recommend it. Metalix provides an advanced platform for cost estimation of production times and costs to assist you when preparing quotes. The cost estimation module is available in cncKad and AutoNest. 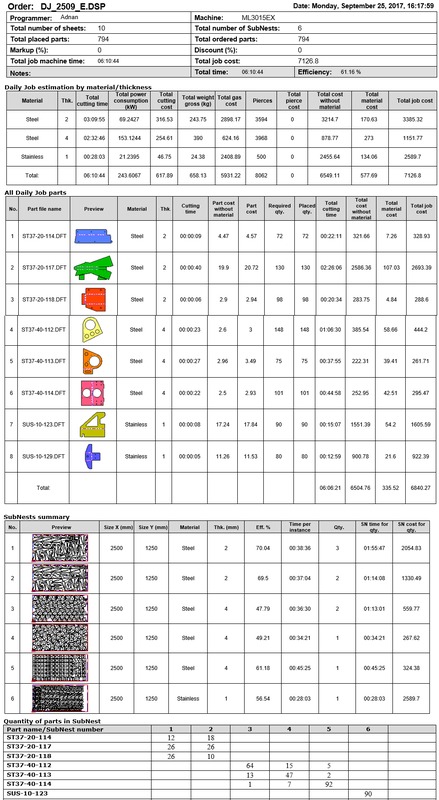 The estimation data is presented in both a dedicated viewer and generated report documents. Detailed processing time of the different production stages: cutting, piercing, head traveling, etc. Properties of the product: shape, thickness, material, etc. For punch machines: punch and nibble speeds, time for changing tools and moving turrets, etc.